Now in its 11th year, the annual ICEF i-graduate Agent Barometer continues to be a landmark survey of the practices and perceptions of education agents around the world. The 2017 edition was released at the ICEF Berlin Workshop last week. It registered a dramatic increase in the response rate of recent-year surveys with 1,456 respondents from 107 countries (this compares to 1,111 responses last year) over the September–October 2017 survey period. As in previous years, the respondents were widely distributed by country with only India (16%), Nepal (7%), Brazil (7%), and Nigeria (5%) accounting for 5% or more of the total sample. The 2017 respondents reported a very comparable programme mix as we have seen in recent-year surveys. Roughly eight in ten (79%) indicated that they recruit for undergraduate programmes, and 76% for post-graduate courses (this is up slightly over the 74% who reported recruiting for advanced degrees last year). Nearly three quarters (74%) said that they also recruit for language programmes, and roughly half promote secondary schools and vocational training courses. The areas of emphasis within the agents’ programme portfolios can be seen a different way when we consider the number of referrals to each type of course. Not surprisingly, language studies are the clear leader in this respect, accounting for just over one third of all reported placements in 2017. Post-graduate programmes account for the next largest share with nearly 14% of all referrals this year; undergraduate degrees follow close behind with 12%. Secondary schools and vocational courses each received about 4% of all placements from this year’s respondent field. Responding agents also reported an impressive range of counselling and support services for students and families, underscoring again the importance of local agents in service delivery for outbound students. Nearly all provide counselling and advice for programme selection, and also assistance with admissions applications and visa processing. As the following chart reflects, smaller (but still significant percentages) offer more extended support services, including career guidance, pre-departure briefings, and airport transfer and accommodation supports. As in previous years, respondents indicated a strong view as to the actions that institutions and schools can undertake to boost recruitment. Nearly all (92%) rated “quick response time to enquiries and applications” as the most important factor in marketing for institutions. Agent training and support also rated highly, as did incentive programmes and prompt payment of commissions. In a new item of note for this year, eight in ten respondents also indicated that would be interested in establishing agreements to refer students to online programmes. Those support services are thrown into sharp relief when we place them next to a summary of student concerns about study abroad, both before departure and after arrival at their study destination. The following chart maps those concerns, with pre-departure ratings shown in dark blue and post-arrival in the lighter blue. 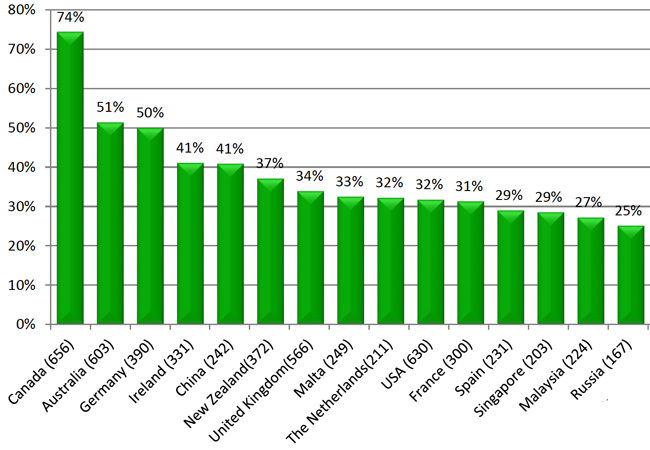 Looking at student perceptions in this way, the chart highlights a fascinating shift between departure and arrival. Before leaving their home countries, students were more likely to be preoccupied with concerns about language skills or finances. After arrival, those concerns switch to more practical issues about the students’ programmes or their broader experience abroad. Echoing the findings of other recent surveys, concerns around accommodation, cultural adaptation, or with the study programme itself loom larger. As such, these findings again highlight the importance of quality accommodations and robust in-country support services in order to quickly identify and address any student concerns and, ultimately, boost student satisfaction. Another interesting perspective emerges when the survey drills down into more detail around student mobility concerns. This year’s Agent Barometer continues to track mobility concerns reported by agents across several key categories, and here again we see a distinct shift over time. Whereas financial issues and concerns about the global economy predominated in the early part of this decade, we now see a greater emphasis on concerns around safety and security. As the following chart reflects, this encompasses both personal safety, which registers as an area of marginally greater concern this year, as well as the broader global political context, which shows a sharper increase as an area of student concern for 2017. We can imagine that this reflects major political currents in leading study destinations, such as the US and UK, along with regional disruptions in locations around the world, notably the current tensions on the Korean peninsula. 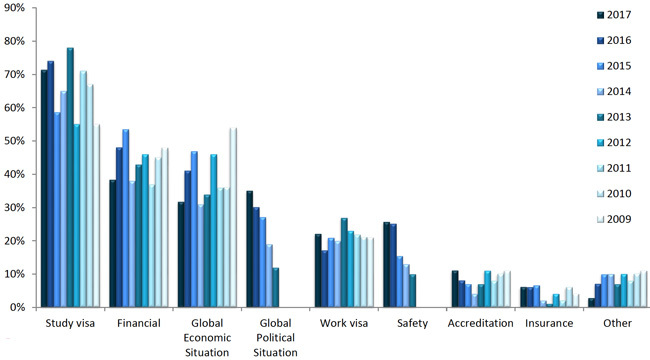 The Barometer survey also measures the relative attractiveness of study destinations as seen by agents, and here we see a continuing trend that may also be informed by political or safety concerns. The full survey results explore this question in some detail, but for the sake of a more concise summary we will limit ourselves here to some top-line findings. These are largely reflected in the following chart, which measures agents’ reports of increased student interest in selected destinations, and shows a pronounced increase in attractiveness among respondents for Canada, Australia, Germany, Ireland, and New Zealand. 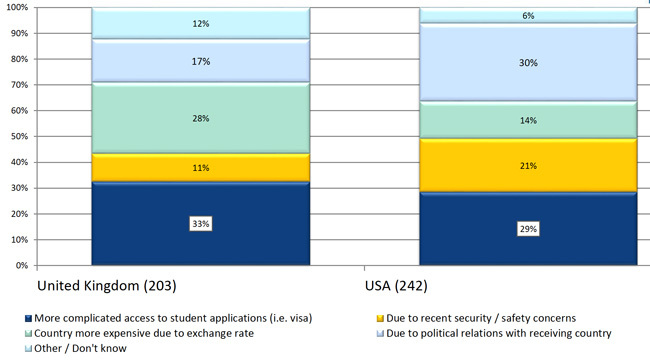 The more complete data for this question also reveals a sharp decrease in student interest for some major destinations, notably the US and UK, which we might also attribute to the increased student sensitivity to personal security and the global political context as noted above. This insight is unpacked somewhat by our final chart below, which explores the reasons given by agents as to why reported student interest appears to have softened this year for these two leading destinations. We should note as well, however, that agents continue to rate the United Kingdom as the best destination for English language studies and Foundation programmes, and the US as the top choice for MBA students as well as work and travel programmes. This entry was posted in Africa, Agents, Asia, Australia/Oceania, Higher Education, K-12, Language Learning, Middle East, Most Popular, North America, Regions, Research, South & Central America and tagged international students, undergraduate student recruitment, universities with international students, student recruitment agencies, student mobility.